Ditto’s House-A-Paloza contest – The Winners!!! So here they are, at long last, the winners of Ditto’s House-A-Palooza contest, all randomly chosen from the qualified entries that were sent in, and all winners have already been notivied via the email address they entered the contest with. I have the “Hidey Hole” monster under my bed..Shes a prankster, she hides things ,moves them to different places and sometimes puts them back so I think I’m a little loopy. She never makes anything disappear forever..just long enough to make you a liitle nuts !!! It is a small furry rainbow colored monster. It is very nice and sweet. The monster under my bed is a storm monster that charges my phone and gives me a light when I read my books.It also provides electricity for the family so we don’t have to pay the electricity bill. The monsters under my bed are dust bunnies. The monster that lives under my bed watches transformers with me every month and has horn with popcorn and marshmallow plants on them and they grow when he is happy he also breathes a small fire which is right temperature for it to be a golden brown color. He looks like a small cute little 2 foot tall dragon with tiny wings and he can barely fly higher than my ankle so I gave to pick him up and put him on my bed so we can watch tv . 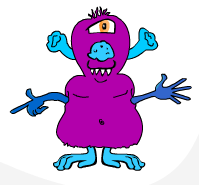 a funny helpful monster lives under my bed he is like a mander who is my personal servent. One night i was having a bad dream.Tossing and turning.Then i heard a comforting voice luring me back into a peaceful sleep. The next day in the morning i asked my parents if they were the ones comforting me, and they said they were sleeping. When i went to bed that night, i stayed up to try to see him and i did! He was a monster and i actually was startled at first but we became good friends. He was as fuzzy and soft as the softest teddy bear in the world. He played with me at night and he was the one i could tell my secrets and thoughts to. He would always understand like a diary. The Monster That Lives Under My Bed! Under my bed lives a monster. He is Cute,Furry and Round. Did I include he bounces around? so he can hide underneath the Moose! my monster is the klytpo monster. He eats one sock of the pair or 1 glove of the match. He is a fun loving monster and is only playing. wanting to hear me laugh. he is fuzzy and made from dust bunnies. Under my bed lives a shy little monster blob. She has fluffy pink fur and big blue eyes. She isn’t shy of me but is very shy in front of other people. Don’t scare her! This entry was posted on August 22, 2011 by dittowizard. It was filed under vBlog, Wizard 101 .